Note to publishers: If you intend to host our files on your server, please instead consider linking to this page. It will help us prevent spreading of obsolete versions, which we believe is critical when security software is concerned. Thank you. Fix 1.20 regression that causes system favorites not to mount in some cases. Fix some cases of "Parameter Incorrect" error during EFI system encryption wizard. disk_encryption_v1_2.pdf related to EFI hidden OS and full fisk encryption dcs_tpm_owner_02.pdf related to TPM configuration for EFI system encryption. This project has moved. For the latest updates, please go here. Use 64-bit optimized assembly implementation of Twofish and Camellia by Jussi Kivilinna. Camellia 2.5 faster when AES-NI supported by CPU. 30% faster without it. Use optimized implementation for SHA-512/SHA256. 33% speedup on 64-bit systems. Deploy local HTML documentation instead of User Guide PDF. Change links in UI from ones on Codeplex to ones hosted at veracrypt.fr Security: build binaries with support for Address Space Layout Randomization (ASLR). Fix bug in EFI system decryption using EFI Rescue Disk Enable using Secure Desktop for password entry. Add preferences option and command line switch (/secureDesktop) to activate it. Use default mount parameters when mounting multiple favorites with password caching. Use CHM file for User Guide instead of PDF. Fix false warning in case of EFI system encryption about Windows not installed on boot drive. Enhancements to driver handling of various disk IOCTL. Enhancements to EFI bootloader. Add possibility to manually edit EFI configuration file. Driver Security: Use enhanced protection of NX pool under Windows 8 and later. Reduce performance impact of internal check for disconnected network drives. Minor fixes. OSX 10.7 or newer is required to run VeraCrypt. 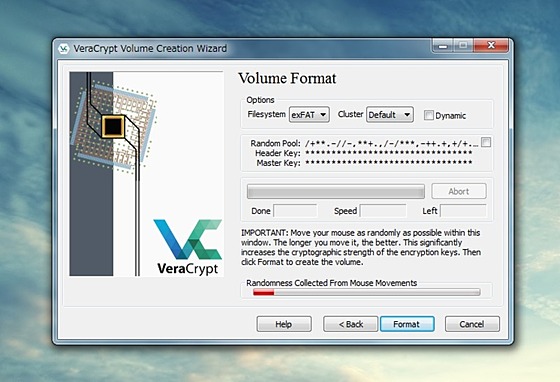 Make VeraCrypt default handler of .hc & .tc files. 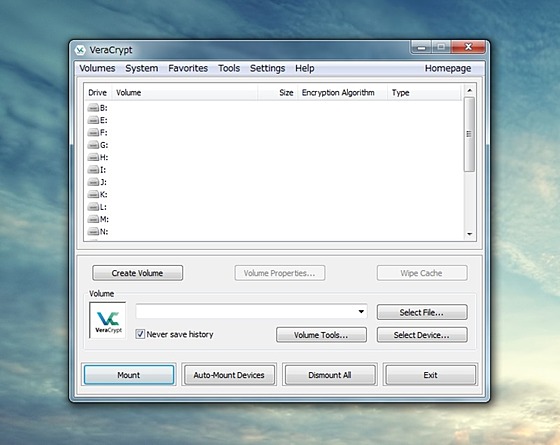 Add custom VeraCrypt icon to .hc and .tc files in Finder. Check TrueCryptMode in password dialog when opening container file with .tc extension. Fix issues raised by Quarkslab audit. Remove GOST89 encryption algorithm. Make PBKDF2 and HMAC code clearer and easier to analyze. Add test vectors for Kuznyechik. Update documentation to warn about risks of using command line switch ”tokenpin”. Use SSE2 optimized Serpent algorithm implementation from Botan project (2.5 times faster on 64-bit platforms). Fix keyboard issues in EFI Boot Loader. Fix crash on 32-bit machines when creating a volume that uses Streebog as PRF. Fix leak of password length in MBR bootloader inherited from TrueCrypt. EFI bootloader: Fix various leaks and erase keyboard buffer after password is typed. Use libzip library for handling zip Rescue Disk file instead of vulnerable XUnzip library. Support EFI system encryption for 32-bit Windows. Perform shutdown instead of reboot during Pre-Test of EFI system encryption to detect incompatible motherboards. Minor GUI and translations fixes. Remove dependency to MacFUSE compatibility layer in OSXFuse. Support Japanese encryption standard Camellia, including for Windows system encryption (MBR & EFI). Support Russian encryption and hash standards Kuznyechik, Magma and Streebog, including for Windows EFI system encryption. Enhanced protection against dll hijacking attacks. Fix boot issues on some machines by increasing required memory by 1 KiB Add benchmarking of hash algorithms and PRF with PIM (including for pre-boot). Move build system to Visual C++ 2010 for better stability. Workaround for AES-NI support under Hyper-V on Windows Server 2008 R2. Correctly remove driver file veracrypt.sys during uninstall on Windows 64-bit. Implement passing smart card PIN as command line argument (/tokenpin) when explicitly mounting a volume. When no drive letter specified, choose A: or B: only when no other free drive letter is available. Reduce CPU usage caused by the option to disable use of disconnected network drives. Add new volume ID mechanism to be used to identify disks/partitions instead of their device name. Add option to avoid PIM prompt in pre-boot authentication by storing PIM value unencrypted in MBR. Add option and command line switch to hide waiting dialog when performing operations. Add checkbox in "VeraCrypt Format" wizard GUI to skip Rescue Disk verification during system encryption procedure. Allow files drag-n-drop when VeraCrypt is running as elevated process. Minor GUI and translations fixes. Fix mount issue on Fedora 23. Fix mount failure when compiling source code using gcc 5.x. Adhere to XDG Desktop Specification by using XDG_CONFIG_HOME to determine location of configuration files. Add support for creating exFAT volumes. Add GUI indicator for the amount of randomness gathered using mouse movement. Solve issue with system favorites not being able to be mounted to drive A: Solve lost focus issues for after displaying the waiting dialog Solve rare issue where some partitions where asscoiated with wrong disk the "Select Device" dialog. Implement PIM caching, for both system encryption and normal volumes. Add option to activate it. Don't try mounting using cached passwords if password and/or keyfile are specified in the command line. Internal rewrite to make VeraCrypt native UNICODE application. Workaround to avoid false positive detection by some anti-virus software. Hide disconnected network drives in the list of available drives. Add option to make them available for mounting.